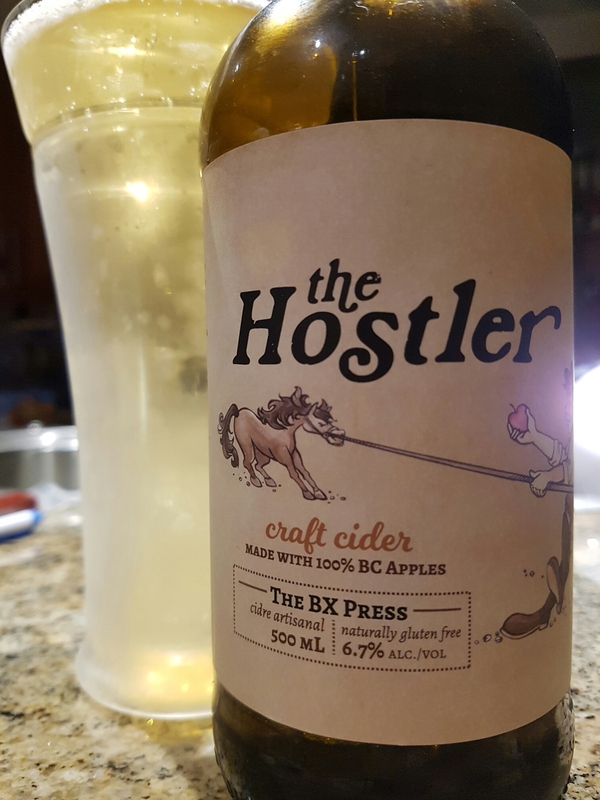 the Hostler – The BX Press Inc. (Vernon, BC, Canada) | Justintoxicated. 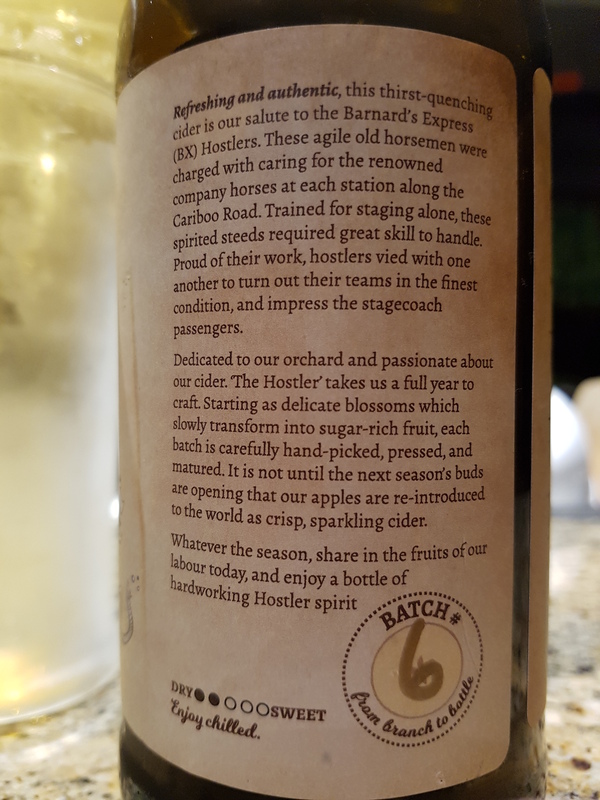 “Refreshing and authentic, this thirst-quenching cider is our salute to the Barnyard’s Express (BX) Hostlers. These agile old horsemen were charged with caring for the renowned company horses at each station along the Cariboo Road. Trained for staging alone, these spirited steeds required great skill to handle. Proud of their work, hostlers vied with one another to turn out their teams in the finest condition, and impress the stagecoach passengers. 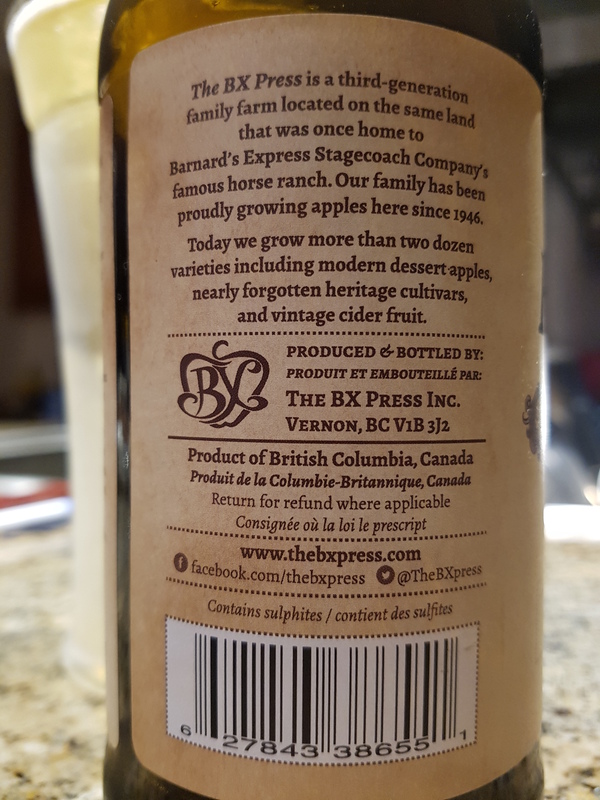 Dedicated to our orchard and passionate about our cider. ‘The Hostler’ takes us a full year to craft. Starting as delicate blossoms which slowly transform into sugar-rich fruit, each batch is carefully hand-picked, pressed, and matured. It is not until the next season’s buds are opening that our apples are re-introduced to the world as crisp, sparkling cider. Visual: Pours crystal clear straw yellow, no head, fast, medium-sized bubble streams. Summary: It being on the dry side, you get to appreciate the subtle nuances of the acidity along with the bright clean apple flavour. All around clean.